When you think of popcorn, images of movie theatre tubs and golden liquid butter probably come to mind, right? Popcorn for any other meal may seem a bit out of place, but on a college girl’s budget, it’s an ingredient that is easy to find and cook and should never be overlooked. The recipes below all contain popcorn as the featured ingredient in meals for breakfast, lunch or dinner and dessert. Don’t deny them before you try them! This piece has a splash of maple syrup and can even be topped with real bacon bits! 1. Cook the popcorn in the microwave. 2. Melt the butter over moderate heat. 3. Stir in the bacon bits and maple syrup. 4. Add the bacon bits and maple syrup to the popcorn, and toss it well. 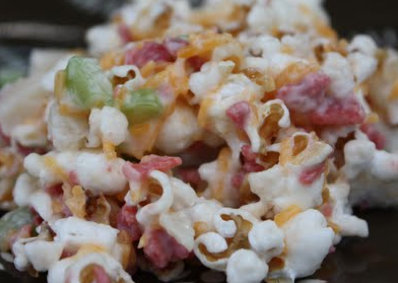 Instead of lettuce, the main ingredient in this salad is popcorn! **Note: 3/4 cup uncooked popcorn makes about 6 cups popped. 1. In large bowl, combine the mayo, celery, 1 cup of cheese, water chestnuts, 1/2 cup bacon, carrots and chives, and mix it well. 2. Add popcorn to the bunch, and stir to coat. 3. Spoon it into a lettuce-lined bowl, top with the remaining cheese and bacon, and serve immediately. While it’s not wintertime yet, we can look forward to making these scrumptious snowmen at our Holiday celebrations this year! 1. In a microwave, melt the butter using low heat temperature. 2. Add the marshmallows, and cook, stirring often, until it is melted and syrupy. This should take around five minutes. 3. Place the popped popcorn in a large lightly greased shallow pan or bowl. 4. Pour the syrup over the popcorn, and toss it to coat evenly. 5. While it is still warm, form six balls about 5" in diameter for the coated popcorn for the bottom sections, giving flat bases to the balls so it will allow the snowmen to stand. 6. Form six balls about 3-1/2" in diameter for the middle section. 7. Then form six balls about 2" in diameter for the top section. 8. 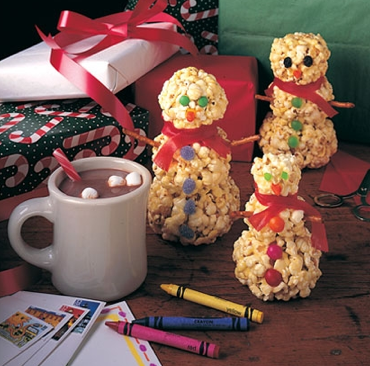 Use the icing to stack three popcorn balls of decreasing sizes into a snowman. Then attach different candies to decorate, such as gumdrops for hats, Fruit Roll-Ups for scarves and M&M’s for eyes. Great recipes. I agree that there are limitless options for making great popcorn. 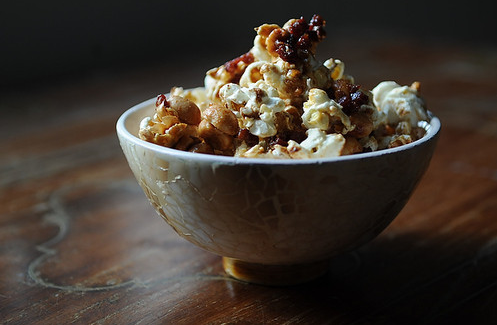 Just think outside the box (of microwave popcorn)!